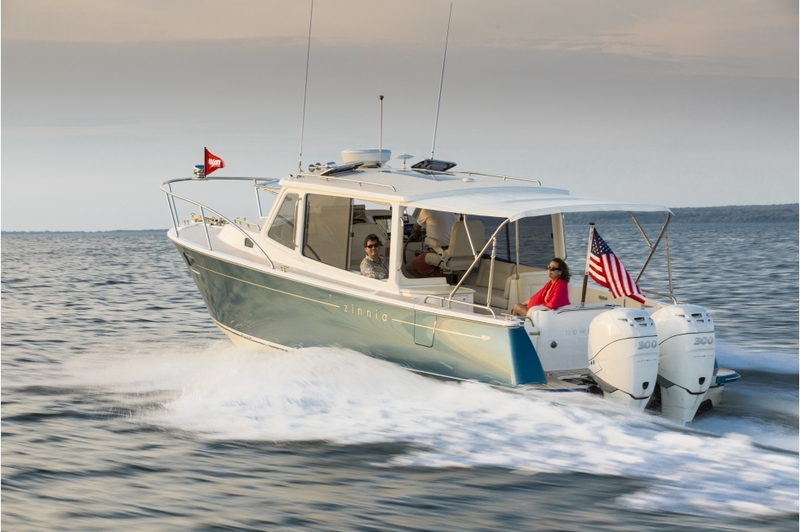 MJM introduces what other outboard brands have sought to achieve… a combination of performance and comfortable all-weather, family boating in a stunning design having great versatility. 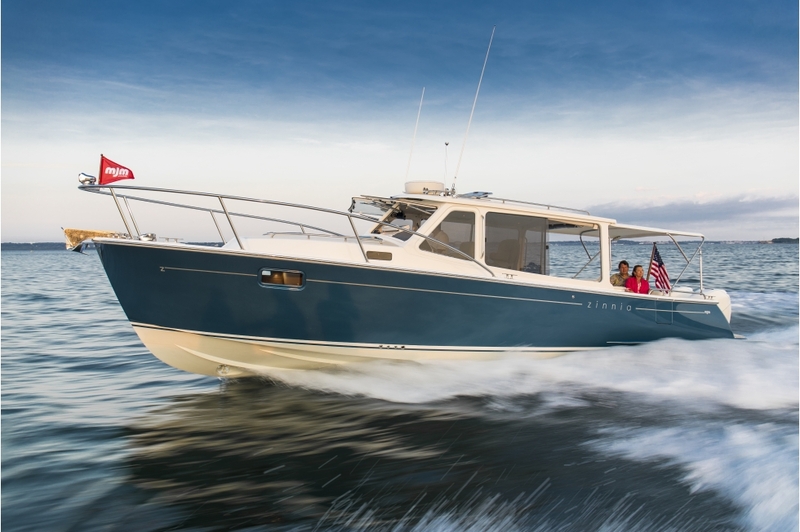 35z’s fuel efficiency, 50+ mph speed and 300+ mile cruising range is achieved with twin 300’s and only 250 gallons of fuel capacity where competing designs need triples and 400 gallons for the same results. 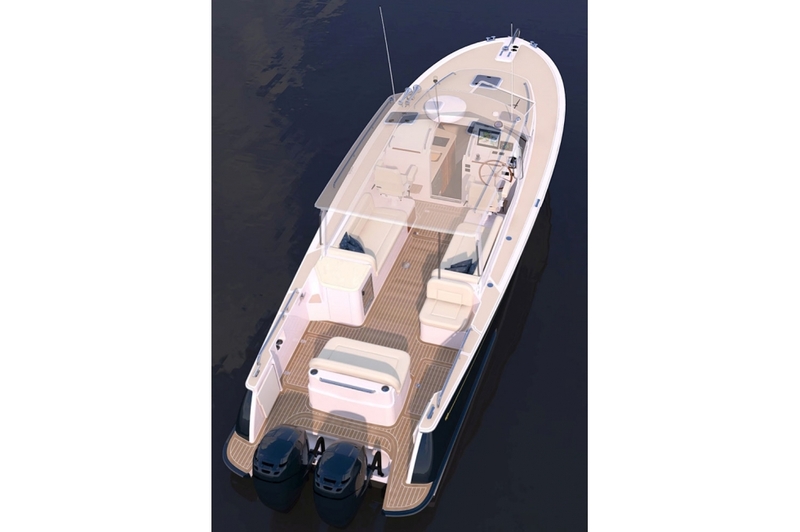 There are two explanations: (1) MJM’s unique pre-preg epoxy composite construction for a stronger, lighter and longer lasting hull; and (2) a seakindly Zurn designed modified deep-V hull with a greater waterline length to beam ratio of 3.5:1 versus a more typical 2.7-3.0 ratio. Another welcome trait is the absence of chine-walk at speeds approaching 50 mph... proven on MJM’s earlier 29z with twin 250’s. 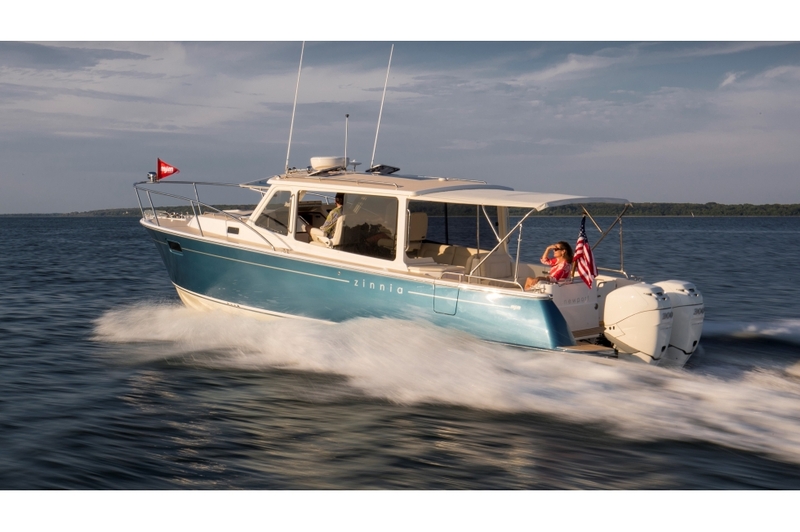 This hull shape gains stability the faster it goes as lifting strakes and chine flats redirect wave and wake energy into effective stabilizing forces. 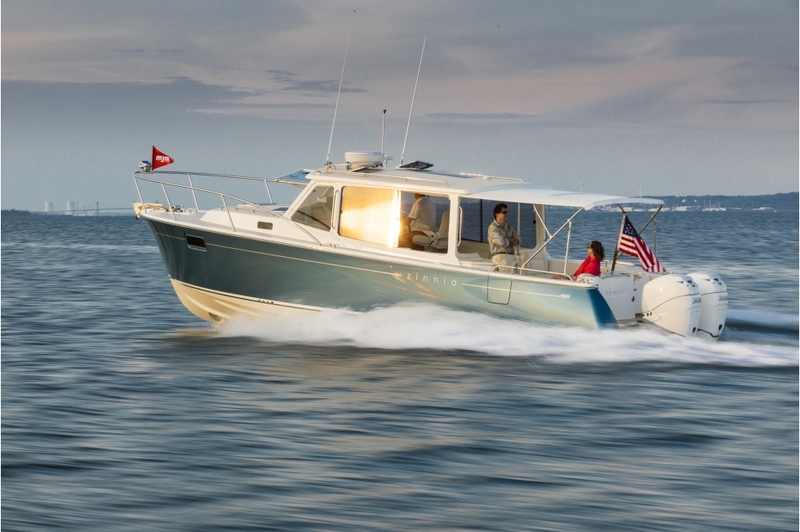 Comfort comes from confidence in the boat. 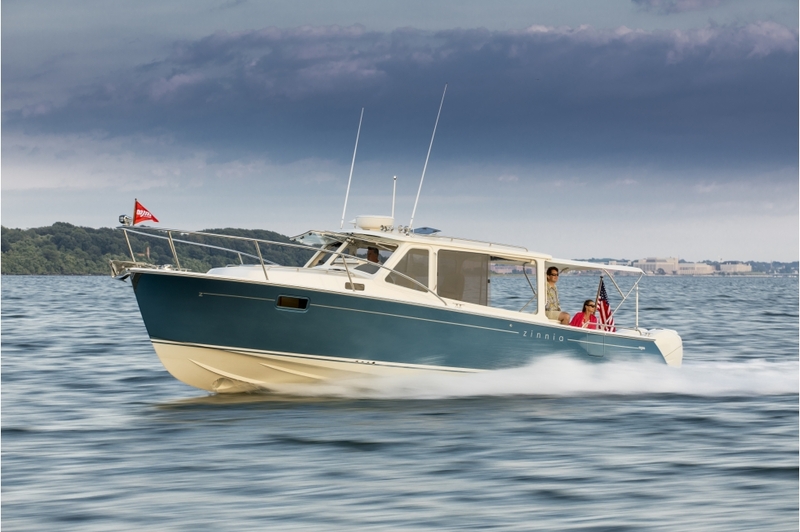 35z will have the highest rating for stability and seaworthiness for a boat under 40ft… ISO Certified Category B “Offshore“. 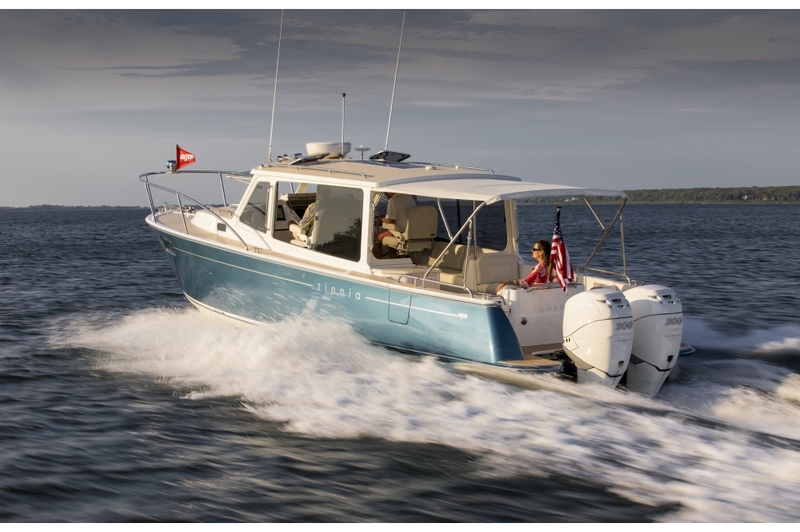 To go one step further, the boat is engineered tough to the Category A ‘Ocean’ Rating of MJM’s 40z and 50z. 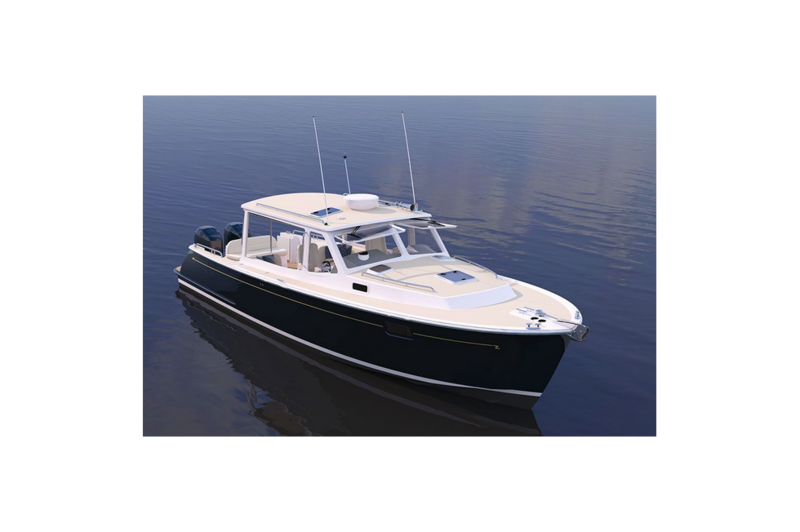 Engines, joystick docking and GPS station-keeping systems are the best ‘state of the art’ equipment available. 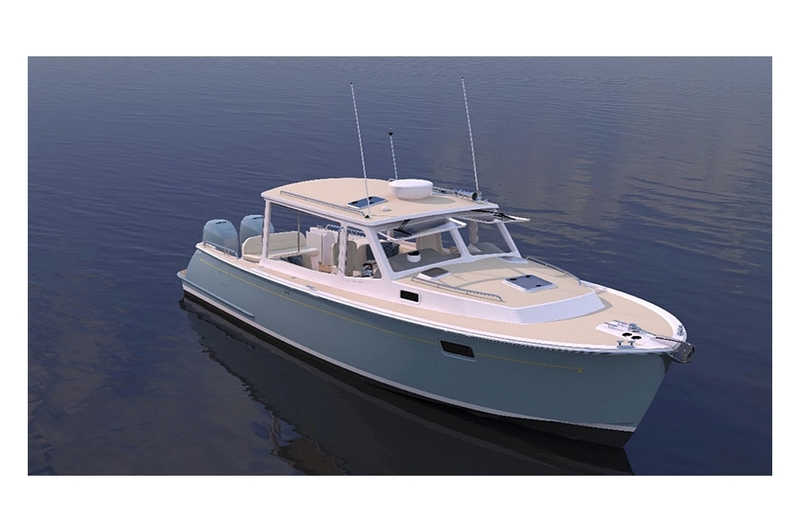 This Eco-Smart™ design combines the graceful beauty of a classic Downeast yacht with a versatile modern layout… open transom, flush deck and side boarding doors. 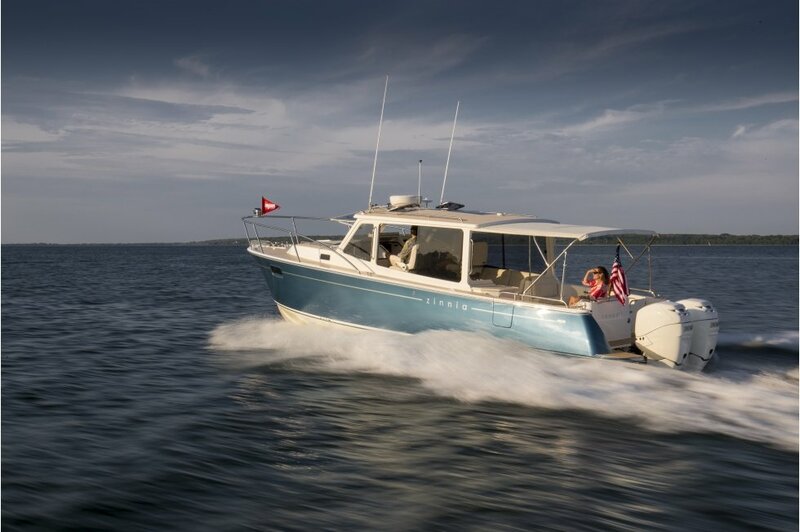 Whether family beachgoer, serious fisherman, weekend cruiser or a combination of all three, 35z is sure to be what you’ve been waiting for. 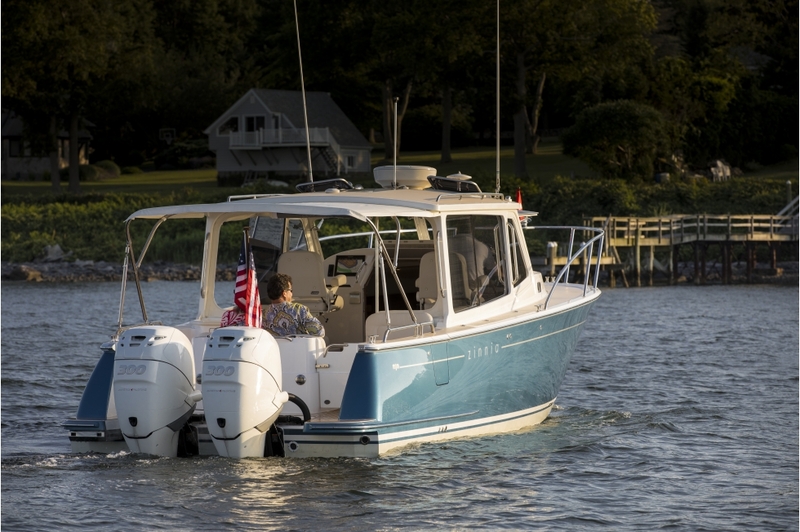 35z has side-boarding doors for easy access and exit at floating dock height… the ultimate set up for running the boat without crew. 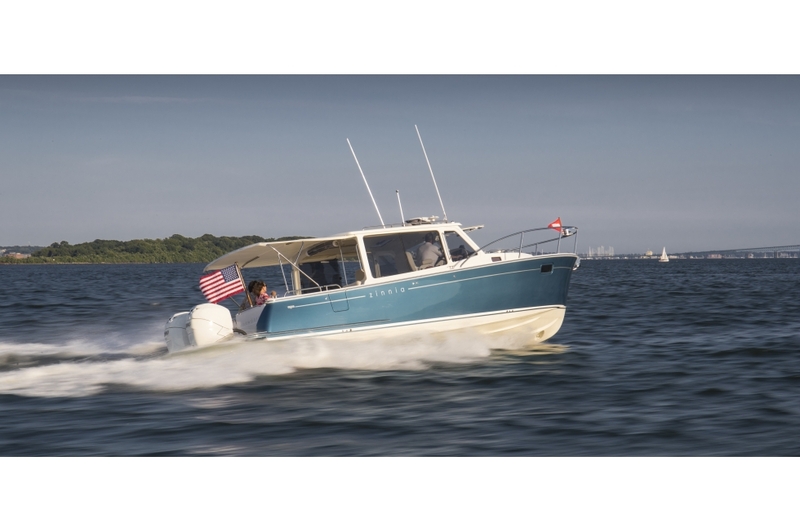 Better than any center console or cabin cruiser, the 35z, as with all MJMs, has fully opening windshields for that wonderful fresh air when desired. There’s even an electric push-button option as we find they are constantly adjusted. You have a choice of either roll-up Strataglass or tinted sliding safety glass for the side openings. 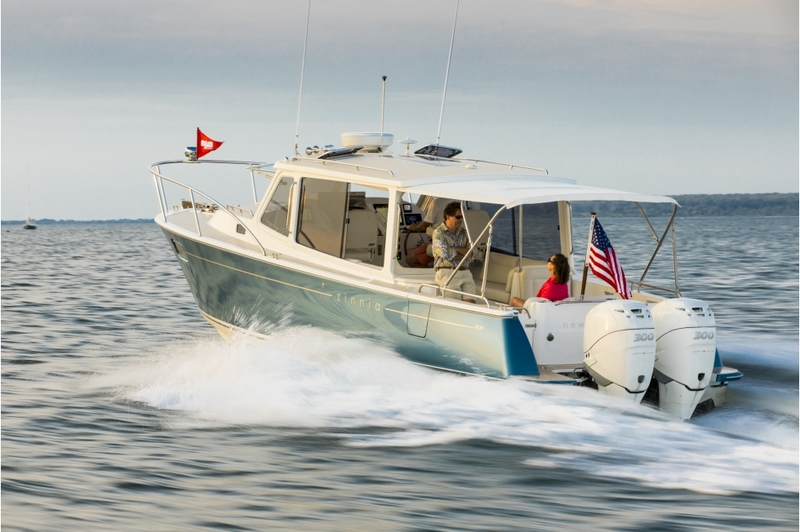 A bow rail similar to that on other MJMs with spotlight and burgee staff is an option as are a range of fishing options for the casual or serious fisherman. 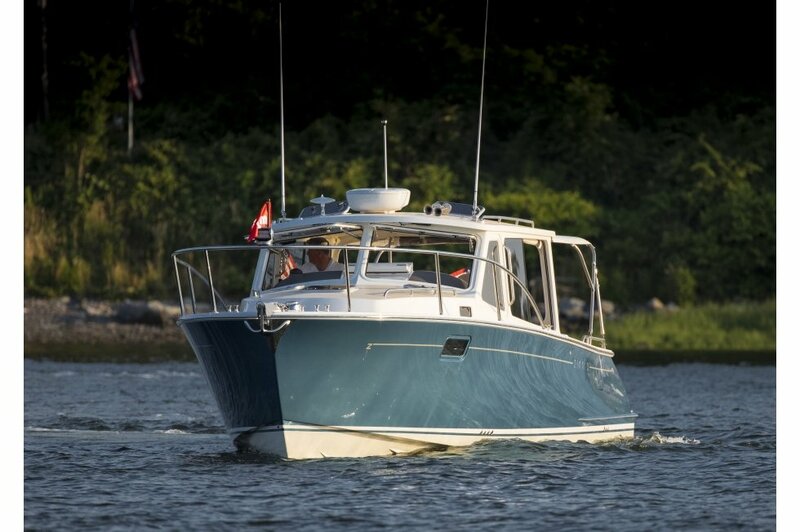 The pilothouse doubles as a 2nd Cabin at night with settees converting to two full-length berths and the privacy/sunscreen curtain fully enclosing the area. 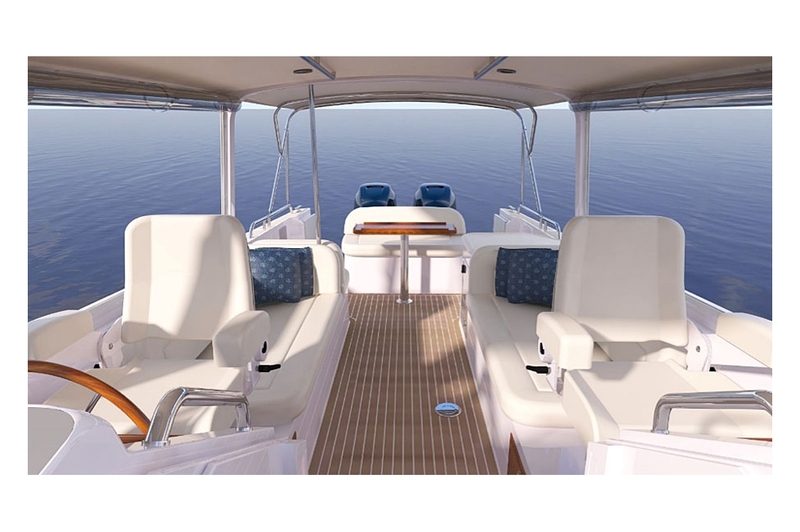 The cockpit table opens up to 24”x 36” for dining and as shown has two other socket locations: the cockpit and V-Berth. 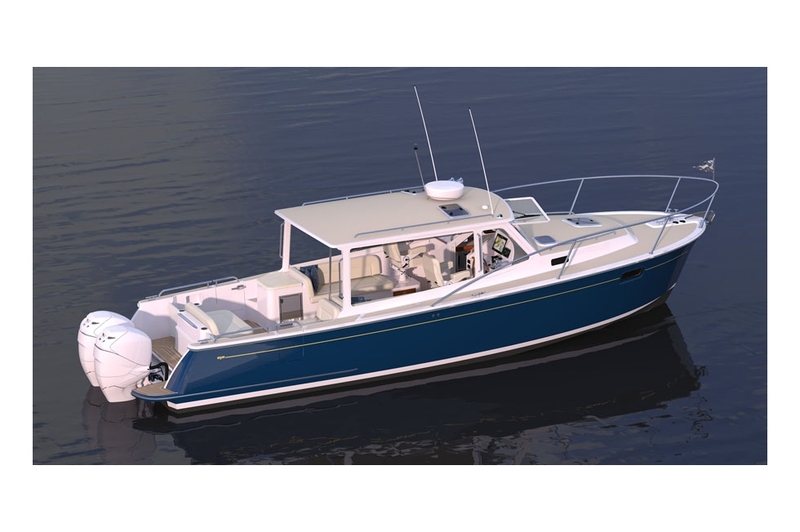 Needless to say, with no diesels and/or Hamilton Jet Drives under the deck, the 35z has tons of storage for all the camping, golf, bicycling, diving, fishing and watersport equipment imaginable. 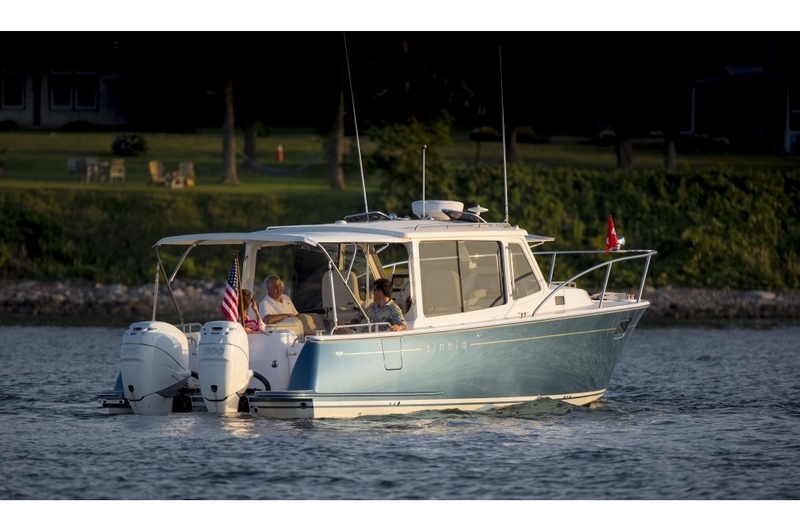 Also available are stainless steel racks on the hard top for kayaks or paddleboards. 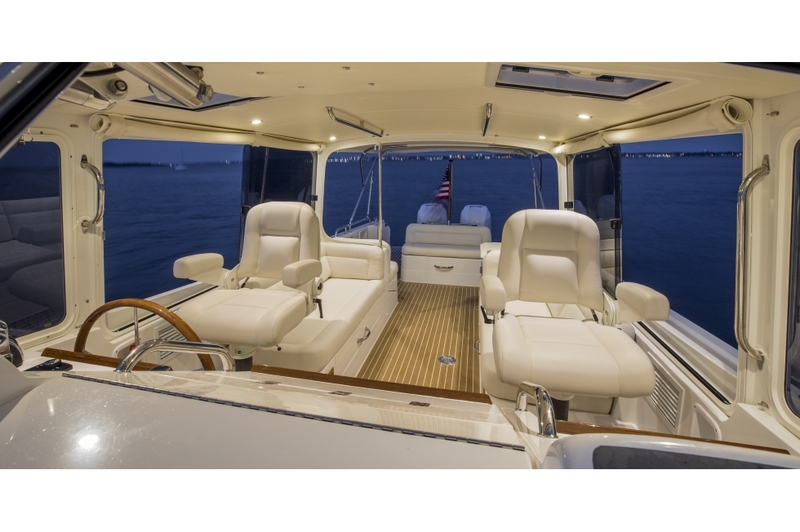 The serving bar to port can accommodate an electric grill, bait well, sink, icemaker or fridge. Twin Stidd piloting seats pivot and lower on telescoping pedestals to form “living room” side chairs to seat 6 people comfortably in any weather during cocktail hour. 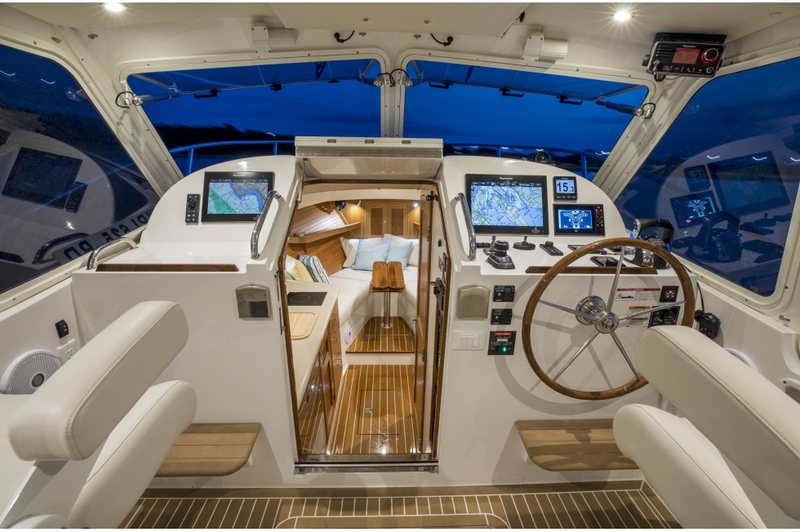 A full and very effective cockpit Bimini, proven at 35 knots on the 50z, is offered as an option. 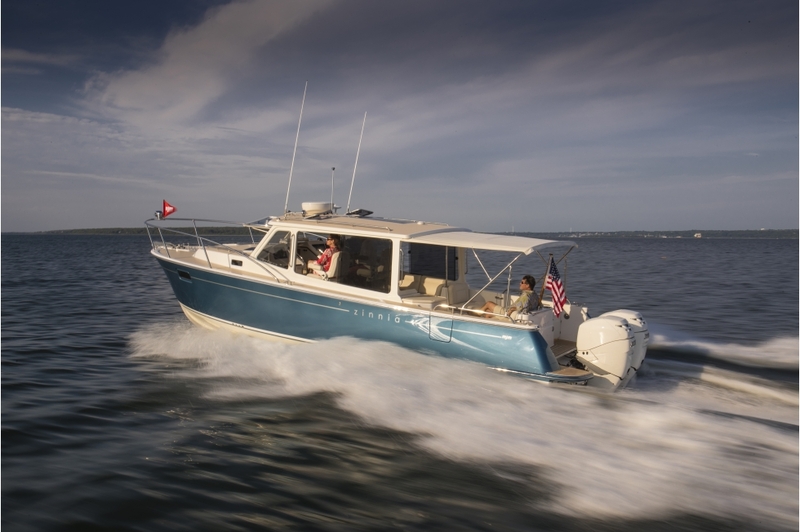 If worried about a wave coming aboard from aft: That’s dealt with by a unique pair of safety doors which can be locked open or closed at any time to keep the kids and pets aboard, but when underway and unlocked in rough weather are designed to swing forward and be held with a spring hinge so the boat can’t be “pooped” by a wave or wash if backing down on a fish… but open like an automatic bailer, if water should ever get into the cockpit. 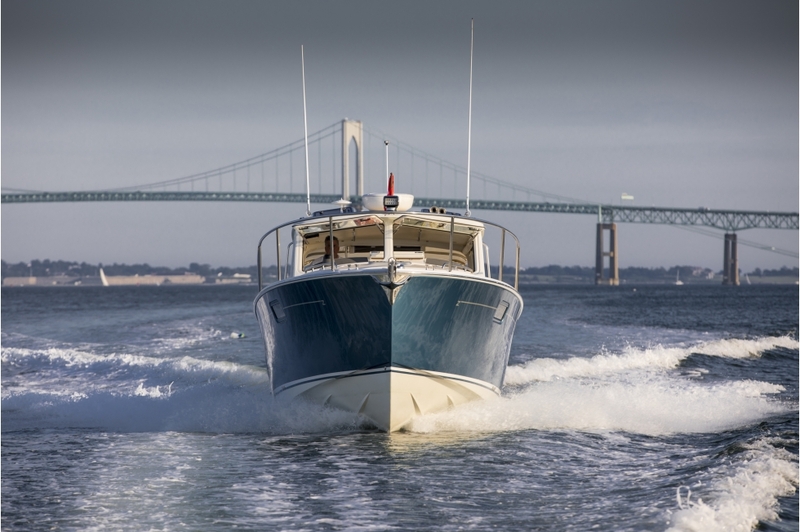 A sense of elegance and being on a real boat for civilized cruising is not lost when going below. 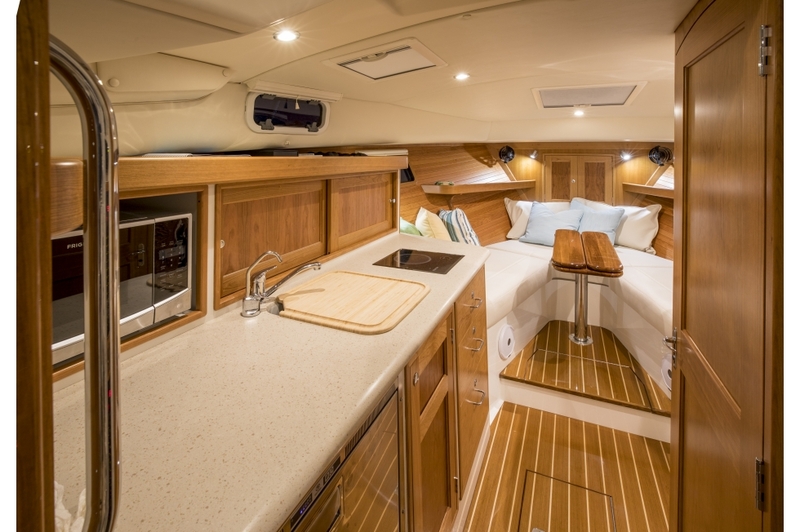 A clear Awlgrip finished teak & holly sole is combined with satin-finished cherry battens on the hull, 6 ft. headroom, Ultraleather upholstery and beautiful cherry joinerwork on door frames, drawers, fiddles and cabinets. Storage shelves over the berths are perfect for duffel bag weekending. 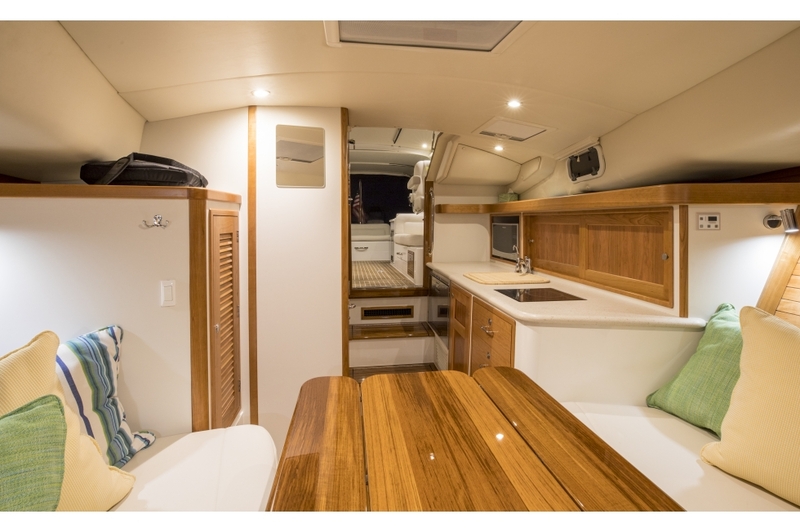 The galley has plenty of storage above the counter and below. 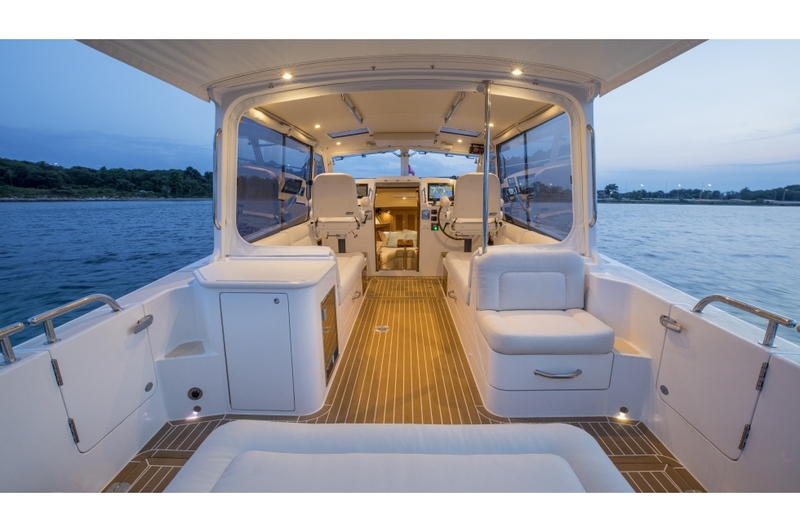 There are two lockers in the cabin sole, a hanging locker and head with shower… plus a deck shower on the transom. 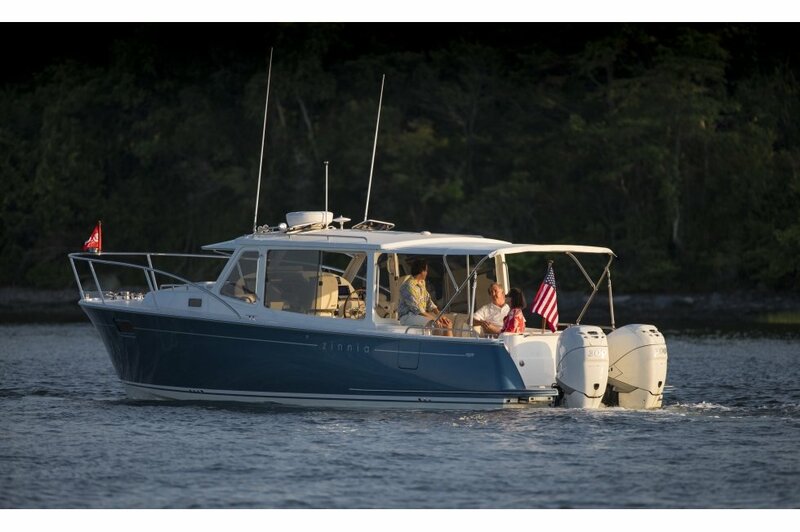 Seven hull ports, portlights and deck hatches bring in lots of light and air. 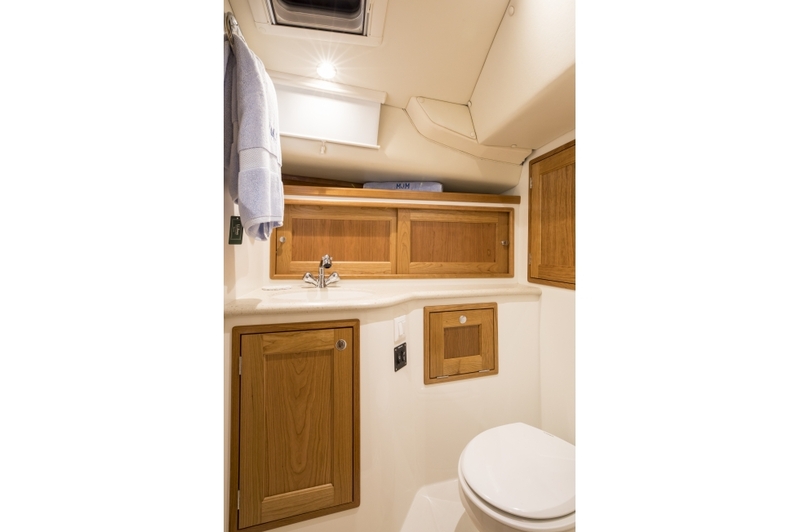 There are a pair of very adequate, almost 7 ft. long berths with optional “filler” for a double berth conversion.